Changhyun Choi is a Postdoctoral Associate in the Computer Science & Artificial Intelligence Lab (CSAIL) at Massachusetts Institute of Technology (MIT) working with Prof. Daniela Rus. He obtained a Ph.D. in Robotics at the School of Interactive Computing, College of Computing, Georgia Institute of Technology. His broad research interests are in Visual Perception for Robotics, with a focus on object recognition and pose estimation, visual tracking, and 3D registration. Changhyun Choi is a Postdoctoral Associate in the Computer Science & Artificial Intelligence Lab (CSAIL) at Massachusetts Institute of Technology (MIT) working with Prof. Daniela Rus. He obtained a Ph.D. in Robotics at the School of Interactive Computing, College of Computing, Georgia Institute of Technology, wherein he was also affiliated with the Institute for Robotics and Intelligent Machines (IRIM). 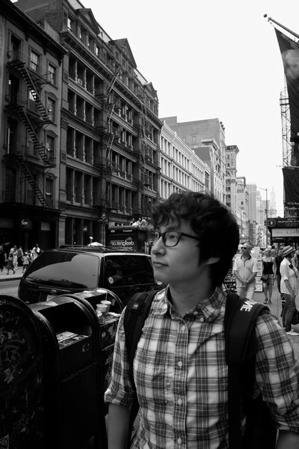 He was a research intern in the Imaging Group of Mitsubishi Electric Research Labs (MERL) in Cambridge, Massachusetts, an intern researcher at the Imaging Media Research Center (IMRC) at Korea Institute of Science and Technology (KIST), and an undergraduate researcher at the Intelligent Systems Research Center at Sungkyunkwan University. He holds a B.S. in Information and Communication Engineering from Sungkyunkwan University. His broad research interests are in Visual Perception for Robotics, with a focus on object recognition and pose estimation, visual tracking, and 3D registration. Copyright © 2014-2015. All rights reserved. | Originally designed by TEMPLATED | Adapted by Changhyun Choi.